Already 771 honest reviews ! A supernatural force sets out to exact revenge against art profiteers attempting to exploit a series of paintings by an unknown artist. Critique is so limiting and emotionally draining. I’ve always wanted to do something long-form, beyond opinion. Dip my toe into an exploration of origin and essence. A metamorphosis of spirit into reality. I’ve… I’ve never had the vehicle until now. Regularly I’m asked to watch a low-budget film and to give my opinion about it. And once in a while, I’ll accept such a favor. But when someone asks me, to watch a horror movie every month, and then report on it, I can hardly refuse it. It’s a win-win situation. I’m simply a mega fan of horror. And the one who asked me to do it is someone terrified to watch a horror movie. 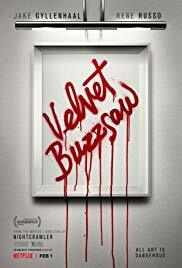 And when asked which horror I should watch this month, I got the answer “Velvet Buzzsaw“. Well, time to carry out this task so they won’t be disappointed. Horror? Get out of here. I can already reassure the person who asked me the question. “Velvet Buzzsaw” is far from frightening or creepy. The number of jump scares is frighteningly low. I’ve only discovered one. And that was only because a cat suddenly jumped into the picture. So, I think the horror label is a bit misplaced. The most creepy aspect of this film is how supercilious, pedantic and arrogant art connoisseurs and artists in the world of modern art are. What frightened me the most, was the realization that it might actually be that way in real life. And the further in the story, the more ridiculous it all gets. The film became funnier instead of creepier. Is Gyllenhaal in it? Bring it on! Initially, I was very excited to see this film. And all because of the fact that Jake Gyllenhaal (as art critic Morf Vandewalt) and John Malkovich (as the inspiration-seeking artist Piers) play a role in it. Two top actors who each have their own unique way of acting. If there’s something I enjoyed the most in this film, it’s the acting of Gyllenhaal. A respected, but also feared, art critic. He struggles not only with his sexual orientation but also with the question of whether he still has the ability to judge and criticize art. He succeeds in convincingly putting up a picture of this closed world, full of people who are convinced that they have incomparable knowledge of art. An image of these art-loving people as I’ve always imagined them to be. It’s just a pretentious bubble. Just like Gyllenhaal here, those artificial individuals speak in such terms that you actually have no idea what they are talking about. It seems as if Gyllenhaal’s dialogues are just a combination of pseudo-intellectual terms. In normal human language: he shakes countless intellectual sounding quotes out of his sleeve which are meaningless at the same time. Morf is someone who has an opinion about color, shape, and correlation with the environment for each object he sees. Whether it is about a randomly placed chair in a hotel room or the clothing of an employee. Even the color of a coffin gives him reason to criticize. And this shallow attitude also applies to gallery owner Rhodora Haze (Rene Russo), artist Piers (John Malkovich), employee Gretchen (Toni Collette), art connoisseur Jon Dondon (Tom Sturridge) and every average gallery visitor. All of them pretentious and weighty characters who, if you study them further, are uninteresting and not sympathetic people. The scene in which Jon Dondon sees a stack of garbage bags and thinks it’s a work of art, is a clear proof that the world of modern art is no more than a bubble. It is only when Josephina (Zowe Ashton) discovers that her upstairs neighbor was an obscure artist, who tried to destroy his works of art because he thought it’s possessed by a supernatural force, the mood gets morbid. The deceased artist Vetril Dease appears to have experienced a disturbing past where there was physical abuse, murder, torture and shocking experiments in a psychiatric institution. All this is reflected in his controversial paintings that arouse emotions with those who admire it. And the people who want to make a profit from it, are confronted with the murderous aspect of Vetril’s artworks. Is it because of a demonic nature? Or is it just coincidence? There’s more to find on Netflix. No, “Velvet Buzzsaw” is certainly not horror. It’s a successful parody of the art world. A world where the emphasis is not on the artistic level or creativity, but more on investment value and profit margins. Artists deliver tons of artworks in order to obtain a well-stocked catalog. In the past, these works of art were exhibited in crowded galleries. They now disappear into anonymity after being included in the private collection of wealthy art collectors. As Rhodora puts it: “So much easier to talk about money than art“. However, do not expect frightening or creepy situations. The film immediately reminded me of “Deep Dark“. Not directly comparable. But it’s also a film about absurd artworks and might give you the shivers. “Velvet Buzzsaw” can be seen on Netflix. But believe me. There are other Netflix products that are much better.